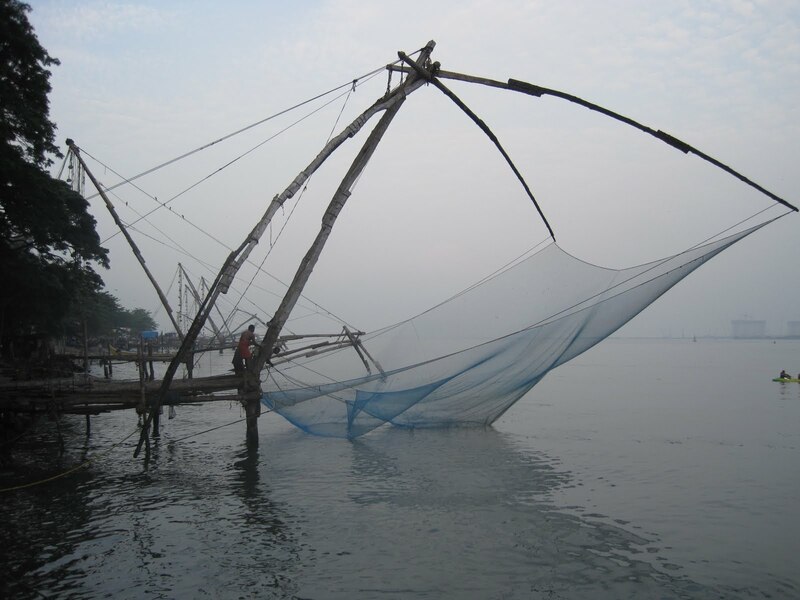 After a crazy bus ride with a Kamikaze bus driver who spent the whole trip just barely avoiding rickshaws, cart pullers, cows, people etc, we finally arrived in Alleppey thankful for our lives. At the bus station we ran into a nice young Indian man in his twenties named Ami, who approached us in a very un-Indian way by saying, "excuse me, but if you might be looking for a place to stay I could possibly help you." We went with him to his guesthouse; a ten minute ride with Molly riding on the back of his motorbike (backpack and all), and me, Dev, and Mel squished into a rickshaw for a not so comfortable 10 minute ride. When we arrived at his guesthouse we were pleasantly surprised; it was a big colonial looking house shaded under a huge mango tree, that he had converted into a backpackers place. We took two rooms, settled in, listened to his proposal for a houseboat and canoe trip, then decided to check out a few houseboats on our own. After being taken down to the houseboat docks and hassled with by this annoying young business man whose ambition in life was to be in the Lonely Planet (which will never happen seeing as this guy relentlessly was trying to rip us off and force us into renting one of his houseboats). It got to the point where as we were trying to get off the boat he was trying to stop us by pretending to receive these phone calls (mind you his phone never rang and he just picked it out of his pocket and started talking) saying that two whole buses of tourists were arriving tomorrow and going to take all the boats, (when there are hundreds of houseboats). 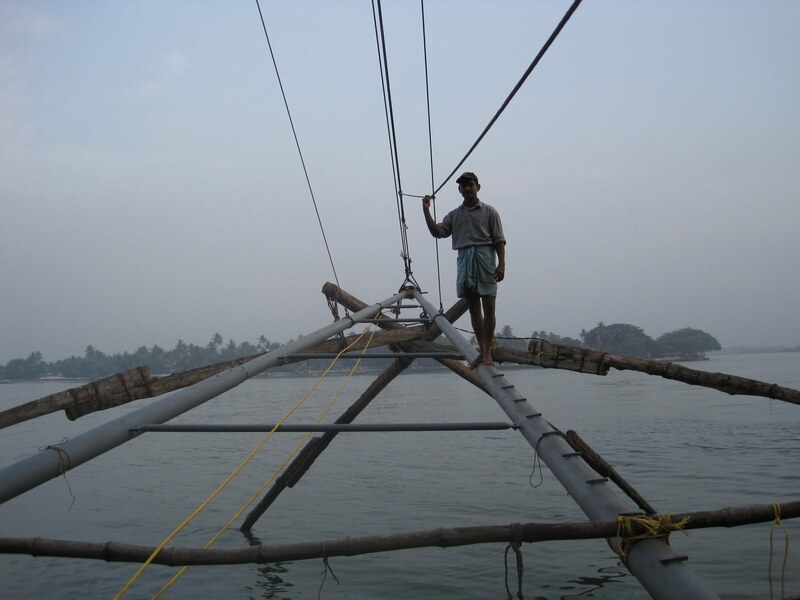 He then continued to play his act by giving one specific couple on the phone, who he was supposedly talking to, specific instructions to wire 9,000 rupees into his account for the booking of the houseboat we were looking at right then. 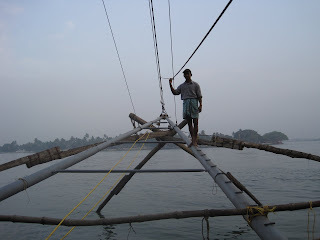 The whole thing was just so ridiculous we could not stop laughing; he even chased us off the boat and continued trying to convince us to rent a houseboat from him as we sat in the rickshaw waiting for a ride back to our guest house. That night Ami gave us some free Indian cooking classes and we made a huge feast with a Canadian couple and twoFrench travelers. It was some of the best home made Indian food we had so far. We went to the store and shopped for all the ingredients including fresh fish and spices; then we helped him prepare a delicious and spicy fish curry and tomato fry along with rice and parotta (a parotta is a thick stringy doughy tortilla.. if that makes any sense). Anyways this was the first night we had eaten parotta and over the next week it turned into our favorite breakfast, lunch, snack, and dinner item. I just wanted to say thank you for following the blog! I must admit that we are home now after a great 13 weeks in India/Nepal; seeing as we didn't finish telling you about our trip I am going to continue posting some stories and pictures from our adventure. So, know that we are safe and sound, and survived the craziness, and hopefully you can continue to enjoy our adventure! While Kate and I were in Bangalore we were fortunate enough to attend two south Indian weddings. I was expecting the loud dancing weddings like the one in the movie Monsoon Wedding, but apparently those are north Indian weddings, and south Indian weddings are slightly different. First of all, they are entirely about eating! The first wedding we were invited to was one of Kate's old work buddy's brothers, so we went with a bunch of people from SEVA (the NGO she worked with). We showed up at the office on time, but of course didn't leave for an hour or so, true Indian fashion. As we were leaving the office and heading to the wedding I got my first taste of riding through the crazy streets of Bangalore on the back of a moto....quite an experience. There are no lines in the road, and people just weave in between each other and cross over three lanes of traffic with no light, it's pretty hectic. But, this is about the weddings, not the driving, so let me get back on subject. When we arrived at the wedding the ceremony was pretty much finished. It was 1 pm and apparently the ceremonies had been going on since 6 am; so when I thought we were going to see a real Indian wedding it turned out we were just showing up for lunch! We waited in line for awhile, then we entered the dining hall, below the reception hall, where tons of tables were lined up facing each other. The scene in that room was nothing like I have ever witnessed before. As a big group of people finished eating we got to watch the whole process. First there are shirtless men with strings tied diagonally across their chests (symbolizing their Brahaman caste status) that are running the whole scene, and there are about 40 of them. They wipe off the tables, then put a sheet of plastic down, then they set banana leaves in front of each person. Next someone comes around with cups, and they fill them with water and instruct you to wash off your banana leaf. Next comes the good part...the food! Men just shuttle down the rows of people each with a different dish, loading up your banana leaf. By the end of the routine we had about 4 different kinds of salads (including an amazing corn and pomegranate seed one), rice, dal, and all sorts of other yummy goodies. They keep coming around trying to give you more of everything, and you literally have to dash to put your hand over your banana leaf to signal that you don't want anymore, or they just load you up again. Then, after all the main food they come around with heaps of desserts. It's pretty crazy! So, our first wedding consisted only of eating lunch (and they were begging us to come back for dinner). It's pretty funny because people come to the weddings just for lunch, go home for awhile, then change and come back for dinner! It is seriously all about eating! Pretty amazing. They believe that the more people you feed, the better luck you will have. The couple we were staying with said that when they got married, they fed over 2,000 people! Crazy right! Anyhoo, our second wedding was a bit more of a cultural experience. Parimala's (the woman we were staying with) cousin was getting married, and she brought us along for the whole event. It started with an amazing breakfast, then we got to witness all the rituals. The couple has to do rituals that they don't even understand for about 6 hours, it's pretty intense. The woman has to change saree's multiple times, and there is one guy who pretty much runs the show (shouting different things and singing) in sanskrit. Most people don't speak saskrit, so they have no idea what they are doing, they just follow the lead of the guy. At the particular wedding we were at you would think the guy was some sort of holy person, but it turns out he was really a bank manager, but doing weddings was his weekend hobby. After awhile the ceremony moves outside and the brides family does all these things to the groom like wash his feet, give him a new pair of shoes, the father of the bride even holds an umbrella over his head to shade him from the sun! Quite different from an American wedding! The whole process is beautiful, kind of confusing but really interesting! Some of the best parts are the photos and the video shooting that is done. We had to pose in so many pictures, it was quite embarassing, especially because the women looked so beautiful in their sarees and Kate and I looked like crap compared to them. Then the funniest part is that you pose with the wedding party, and you have to stand there and hold your smile for about a minute and a half while they take pictures, and the video guy just points his camera at you. You feel like those people mannequins in San Francisco that hold poses for hours! After about five hours the ceremony was apparently behind schedule because everyone was rushing and freaking out about the tying of the Thali. The tying of the Thali (a necklace) is like the exchange of rings for us, except it has to be done at a certain time according to the couples astrological chart. The family was getting really worried at this particular wedding because they were running behind schedule, and bad things would happen if the Thali wasn't tied during the specified time period. Eventually everything happened ok, and the couple were assured a happy life together! Kate and I decided to leave after the ceremony finished, and everyone was desperately trying to get us to stay for lunch. We were seriously so full from our huge breakfast that there was no way we could eat anything else. Apparently after we left everyone was giving Parimala hell for letting us leave without eating; even the camera guys came up to her and asked why she let us go! It was pretty funny...like I said, it's all about the food! 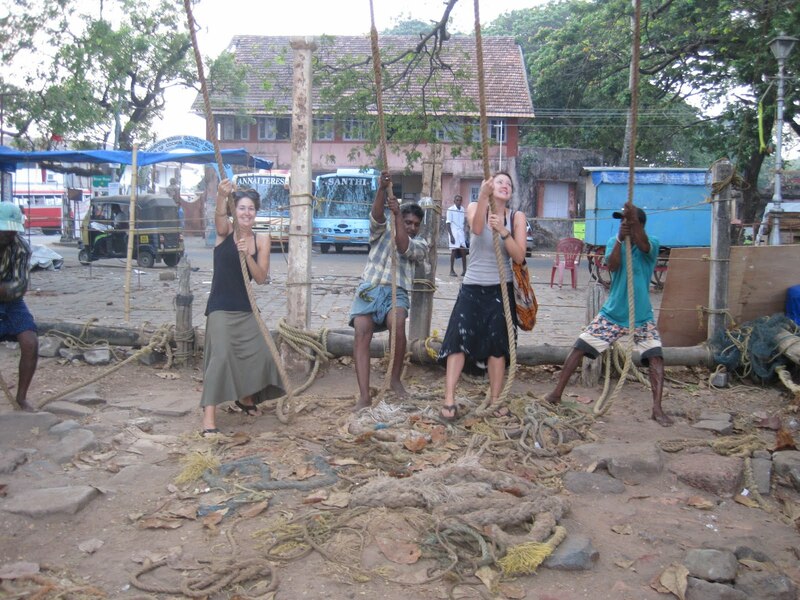 Boys Orphanage,Tuition Center, few Slum pics in Bangalore.. 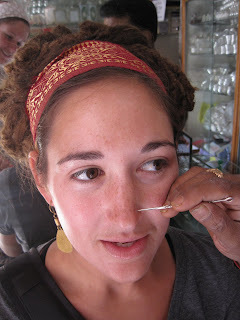 So, seeing as we are in India, and all the women here have pierced noses, we decided to try and get our noses pierced. For those of you who know me well, I have had my nose pierced 4 times, but every time it seems to get ripped out or infected, but I thought heck...fifth times a charm right? Kate had her nose pierced on her last trip here, so we figured we should give it a shot. We met up with one of Kate's local friend who was going to help us find a decent place to get them done. We found a jewelery shop and Somya talked to the guy for us in Kannada, then told us to pick out some earrings, and that we could get them done here. So, we each picked out a nice small gold earring with a little diamond in the middle. Kate was going to go first, but then she started to get a little nervous (with good reason), and I said "No problem, I'll go first." Without even washing his hands, or marking the spot on my nose he was going to pierce, then man came from behind the counter and sat me down on a little bench. He opened a container that looked like it had an ice pick in it, that was soaking in alcohol (hopefully). 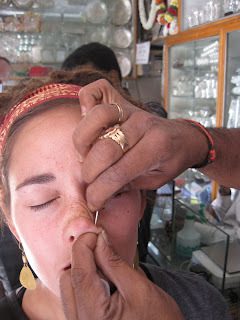 Then, so quickly the guy shoved one finger up my nostril then started jabbing me with the ice pick! 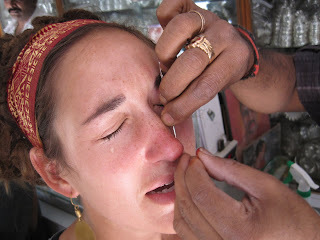 Usually when you get your nose pierced, you feel intense pressure and pain as the needle goes through, then as they remove it the quickly slip the earring in, and the whole procedure takes about 20 seconds. These are under ideal circumstances...and certainly not what happened to me. The guy poked the pick through two times, then on the second time he pushed it through so hard that it actually pierced the inside of my nose too! I kept thinking the earring was in my nose, but as I squeezed Kate's hand, the guy actually walked away from me and left the pick in my nose as it was sliding down, creating an even bigger gash! It was so funny, because at one point I looked up and Kate and she was white faced, and shaking just as bad as I was, and she looked at me and said, "I don't want to do it anymore," and I just looked right back at her and said "you don't have to!" Apparently the guy was so excited to shove the pick through my nose that he forgot the earring! So, as he approached me again, I tensed up as he removed the pick. Right as I thought he was going to insert the earring and it was all going to be over, he dropped the earring on the ground and tried to pick it up and put the dirty thing in my nose. Kate and I both protested so he shoved the pick back in my nose and went to get a new earring. By this time, it had been about two minutes, and blood and tears were covering my face. As he approached me again he said that he needed to put the pick through one more time. That was when Kate and I threw up our arms and said "NO!" We told him to just stop, and I took the pick out of my nose as I was shaking in total shock. All I wanted to do was get the thing cleaned and get the hell out of there, but then it turned into a question of what we were going to pay for the face Moll-ing. He wanted me to pay for the earring, but there was a huge crack in it, so after much debating, Kate pretty much just pulled me out of the shop, as the man sat there saying "very funny!" Luckily I was able to find an antiseptic wipe, but I was still pretty paranoid about infection. I had to ride on the back of Somya's motorbike through Bangalore, and I was just thinking about all the pollution that was probably getting in it! Luckily we were able to make it back to the house after a few hours and get some antibiotic cream and a bandaid on it before we had to take another 15 hour train ride. So basically I have decided that I never want to get my nose pierced again. 5 times is definitely not a charm! Kate still wants to get hers done, but this time we are going to make sure it's some professional, and not some guy that is just ice-pick happy who I'm pretty sure had never done the procedure before!! !